Oh this? Just OHL MVP. No big deal. 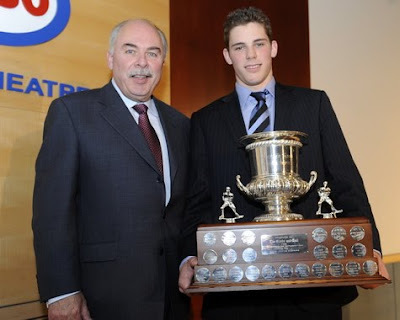 Tyler Seguin's been talked to death but I'm still Psyched for Seguin. Puck Prospectus said he wasn't as good as Hall but that's why he went second overall instead of first. Whatever, he's going to be good. But now it's time to get excited for our next pick. Face of a killer, I tell you what. Pretty exciting, right? I know! I know! Look at that, he's at the net in a bunch of the clips. A kid who goes to the net. And a RW to boot, which granted we don't need as much as LWs but it's still exciting that we've got a good winger in the pipe. 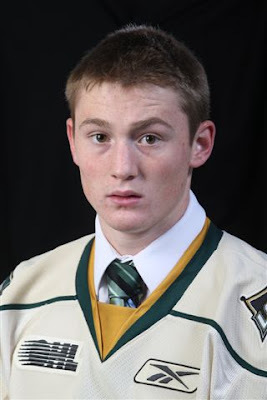 Lets take a look at his OHL production, where he was 5th in points on his team with 36-21-57. However, he had the most goals of the team all year. In the playoffs, he went 10-7-17 (3rd) in 12 games, though he again lead his team in goals with that 10. The kid has a nose for the net and likes scoring goals, which can only be music to Bruins fans' ears. Basically when Recchi retires in 2 7 years Knight will take his spot. Get ready (in like 1-2 years) to Jump for Jared Knight! Go Nuts for Knight! p.s. if there are any London Knights fans out there, please get in touch.